A pair of these were always going to be made for Christmas, but I didn’t expect the time for them to be knitted would come so soon. Such is the way of Christmas, I suppose. So here’s the start I made yesterday evening. I’m using Rowan’s Tapestry in Pot Pourri. I plan to cast on for this today. It’s the Gaiter pattern from One Skein (love that book!). I think my welly sock is a bit too big. I am going to finish off and then try it on to get a better idea. It’s hard to tell when it’s on needles, and it’s too much effort for me to string all the stitches onto a bit of wool, try it on, and put them all back on the needles. I’ve decided to get fit for Christmas. It’s around this time of year that everyone starts eating crap, takes no exercise and gets sick. I don’t enjoy being sick for Christmas. I got back into my running in September but then I had that period where I was just constantly sick and exhausted, and I turned back into a blob. By “running”, I mean jogging very, very slowly. People out walking usually pass me out. If you, too, would like to get into shape for Christmas and feel smug about it, I recommend jogging as the cheapest, most rewarding method. I took it up to lose a lot of weight I’d put on (about 10kg) and I found it really worked. If you like the idea, but are a bit reluctant, here are some tips. * Start off by just running or jogging two or three minutes. The best way to do this is to go out for a walk, and then near the end, run the last bit. When you’ve built up to about ten minutes, try and do a 15 minute run. It’s not about speed, it’s about making it to the time. Remember that a 10 minute jog is worth about an hour’s walk both in terms of using up food and cardio benefits. * By the time you’ve made it to 15 minutes, you will already be looking really good. In my experience, it takes about a week for a change in exercise and eating to show on the scales. This means that if you ate half a packet of biscuits with your tea yesterday, you can cancel it out by doing a run the next day. Seriously, this works! * What goes in must balance what is used up. If you eat too much, you’re going to have to work harder to use it up. This is something I try and think of when faced with chocolate cake. It’s easier to say no and not have to use it up. Or save it to have the day you know you’ll be going for a walk or a run. * If you’re looking to lose a lot of weight as well as get fit, be prepared to get stuck at a certain weight for a while. Fat is stored in layers and the longer it’s been there, the harder it is to get rid of (this means that if you’ve recently put on a bit, like I have, it is easy enough to lose). When I was plugging away at losing that 10kg, I got stuck at 65kg for at least three months. It was infuriating. I eventually lost the last five by training for a fun run. * Running’s not for everyone but it does take perseverence. It helps if you’ve got someone to encourage you when you’ve had a bad run or feel like you’re not getting anywhere. If you can get this person to come run with you it’s even better. * Lastly, you can’t be superfit all the time. Things happen, you get busy, and you don’t always have the time to exercise. You might go two or three weeks without taking regular exercise. The funny thing is though, if you built up any level of fitness before you took a break, your fitness will return very quickly once you go back to it. I’m always stopping and starting and I find that each time I go back to it, it’s that bit easier. * All you need is a pair of runners – which you probably already have – and a good sports bra – which is worth investing in. Branded sportswear is overpriced and over-rated. Not sure where to look? Arnotts and M&S do good sports bras for about e30. You’ll get an excellent pair of Asics runners for about e30 too if you don’t have a pair. They won’t be too snazzy looking but they give great support and are really comfortable. As for the rest, I can’t recommend Penny’s and Dunnes Stores highly enough. Comfortable and cheap. This month, my blog is an innocent one year old. Yay! Happy Birthday blog! There have been a lot of ups and downs. The downs: failed embroidery, the tam o’shanty, and the purple jumper that had a neck hole the size of a pencil. The ups: Mum’s birthday present, my first wearable shrug, and my crowning glory of 2006, the green cardigan. Onwards and upwards! I actually have something to show on my Dad’s Christmas socks. I ripped them out four times. Ribbing is a weird thing but I got it to work for this sock at least. The nice thing about knitting with aran weight wool is that it is super-quick to knit with, so despite ripping it out four times, it still didn’t take me very long to get to the heel. I keep thinking, is it too big? The purpose is to fill up the wellies and make them extra snug. Also, my dad has a penchant for tucking his jeans into the welly socks, so maybe the bagginess at the top is a good thing. Hope springs eternal. I am particularly proud of the heel, which I worked out using Dodgy Maths ™, ie I started where I thought looked right and who would’ve thunk it, it worked! Yesterday, the Winter issue of Interweave Knits finally came through my letterbox. Oh joy! Oh rapture! 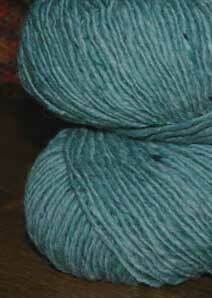 I have been waiting very impatiently to have a better look at this Refined Raglan pattern. But you know? I don’t really like it now that I’ve seen it up close. It has a traditional EZ hem, which is fine, but I prefer a ribbed hem and cuff. I am not partial to gusts up the sleeve. Then there’s the funnel neck – both the name and the shape. The name conjures up images of cold, greasy car ferries. The shape is just awful and I suspect prone to gusts. 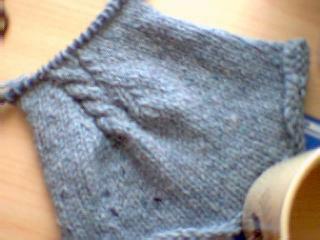 I loved the idea of having a cable running along the raglan decreases, but I don’t like the one in this pattern. So! I knitted a swatch and decided to just knit my own variation on a theme. The yarn is Debbie Bliss Donegal Tweed, a bag of which I picked up on discount at Yarn at the weekend. I love the colour (a grey blue)! Gauge-wise, I got a very convenient 5 stitches to 1″. 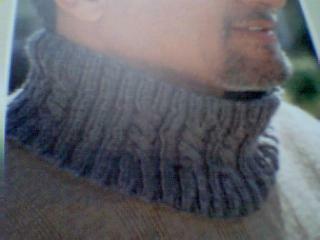 I propose knitting a basic bottom-up raglan and sticking in the cable you see above at the raglan decreases. 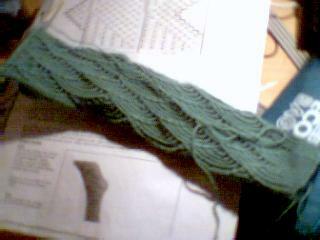 I tried out three different three different positions for the decreases around the cable in the swatch. However, I think what’s used in the pattern (from what I can tell from the photo anyway) looks the best: ssk, purl 1, knit 1, purl 1, cable stitches, purl 1, knit 1, purl 1, k2tog. 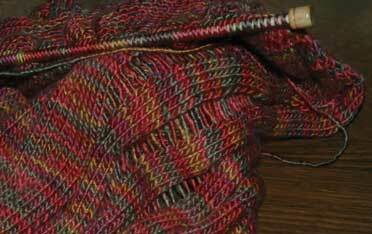 The extra knit 1 and purl 1 gives the cable its own enclosing border. I think for simplicity’s sake I will just put the cables on the front and not on the back. PS The welly sock is just something I’m making up as I’m going along but if anyone else wants welly socks, I can put up the pattern here when I’m finished the first sock. Yes! They are finished. When I last posted a picture of the second sock, I hadn’t realised that the foot was long enough and could have started the toe shaping straight away. Anyway, I got it finished up quickly enough and here they are. Much as I love to show a good photo, I am not lifting my feet above my head to get them in line with the web cam (actually – my dad found my camera cable! I will have proper photos by next weekend). Finishing these up really gave me a boost and I cast on for my Dad’s Christmas welly socks straight away. I’m not using any particular pattern. I’ve already knitted about six inches but they’re ridiculous looking. I started off with about 30% more stitches than I need. This was not on purpose. 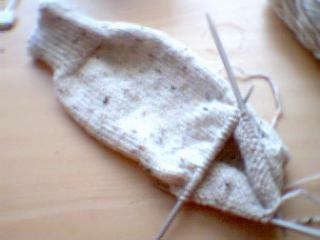 So then I did a pile of decreases and the emerging sock now looks more like an elbow warmer than anything else. It annoyed me so much that it woke me up twice during the night. I kept thinking, if it’s rib, then should I put in negative ease instead of positive ease to make sure they stay up? Another thing that annoyed me is the ‘Complete Book of Traditional Aran Knitting’ that I posted about in my last entry. I was convinced I owned it. Do I? No! But I do have the Complete Book of Traditional Scandanavian Knitting! They look pretty similar and while I was awake during the night, I came to the conclusion that I must have got it out from the library a few years ago, because I have seen it before. Ok. Fine. I did some reasearch and it would be cheap enough to buy second hand online. Why bother? Because I have now seen this book twice and I know for a fact that it is better than the Harmony Stitch guides, and I can’t afford the Barbara Walker stitch dictionaries. It also has a lot of garment patterns as well as separate cable patterns in it. I am in a bad mood this morning because I am 1. back in Dublin, 2. back in Dublin alone, and 3. my enthusiasm for college is on a par with elbow warmers. This morning, I attended a knitting workshop at Yarn given by Lynn Ross. She lives on the Isle of Arran off the coast of Scotland. I don’t know which coast and Google Maps isn’t doing me any favours! Funnily but unsurprisingly enough, tourists visiting the island wanted to buy aran knitting and, fed up explaining that it was a different Arran island, Lynn designed her own aran knitting and set up a site. Lynn’s background is in both knitting and weaving, but she is also into spinning and dyeing her own yarn with natural dyes. She showed us a lovely rainbow scarf that showed just how strong natural dyes can be. I find natural dyeing to be a fascinating concept, especially after listening to Brenda Dayne’s episode of Cast-On about her experiences with it. Unfortunately it would be just one hobby too many for me to get into right now! There were three of us in the group. Liz was from Sligo and Bernie was from Galway. What I really liked about the group was that the three of us had different skills and wanted different things out of the workshop. Bernie was struck down by Knititis last winter and her condition is speedily declining. Horray! She has already knit a jumper and a cardigan and wanted to branch out a bit. She found a really lovely pattern from the Rebecca Mohair Special magazine for a diamond lace long wrappy-roundy garment. Lynn was able to help Bernie get started by walking her through the lace chart as a knitted sample. Liz, on the other hand, had brought a pattern with her but didn’t want to knit it at the given gauge. 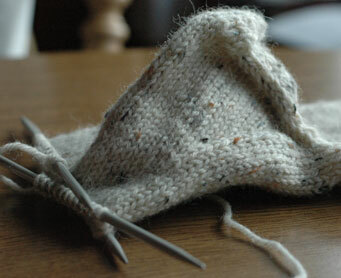 The recommended needle size was 3.25mm for Rowan’s 4-ply soft. She wanted to use a larger needle which would help it work up faster. So Lynn helped her sketch out the basic design of the top, figure out the gauge of her new wool (Kid Classic – yum yum), and how to apply the new gauge to the design. I think Liz really got a lot out of the class and I hope she’ll take her knitting a step further with what she learned. As for me, I honestly hadn’t given an awful lot of thought to the class because I was so busy during the week. I brought my vague idea of knitting an aran jumper with me and that was a bout it. I told Lynn about the bale of bánín I bought on Inis Mór and expressed my dissatisfaction with aran patterns out there. She said, well, why don’t you design your own? She had this marvellous pattern book by Sirdar from the 1960s with many aran patterns. I leafed through it and found a motif that I thought would look really nice as a central motif on the front. Unfortunately, the pattern wasn’t charted at all, so the only way I could figure out how the motif was written was to just knit the pattern. Luckily it was on a cardigan, with the same motif for each side of the front, so I didn’t have to cast on too many stitches. I spent the majority of the class working on this sample. After a break for lunch, I figured out what part of the written pattern was for the central motif, and wrote it down. Then I drew it out and flipped through a Harmony book of stitches for other ideas. I came up with a simple design of just two cables either side of the motif, and a honeycomb pattern on the outer sides of the cables. I was asking Lynn about the wisdom of putting in waist shaping. She recommended that I just make ribbed panels at the sides, which would give a natural shaping. Genius! Just then, Ger came over with this. I recognised it immediately and was astounded at my own stupidity: I own this book! I picked it up for cheap (like, e5) in a second hand book shop in Sligo over the summer! It is a compendium of aran stitches and patterns, and I’m told by Ger, very hard to come by. Crazy! The end of the class came all too quickly and it was time to be on our way. We all thoroughly enjoyed the class – many thanks to Ger at Yarn for setting up the workshop and letting us run amok in her shop! Of course, I couldn’t come away without taking advantage of our workshop discount… I picked up some Debbie Bliss Country Tweed. This is spun by Kilcarra of Donegal and is right up my street. I love the colour and the texture. I just lovelovelove the Colinette they have in stock! I picked up some Point 5 because the colours were irresistible. I think a black hat, with this knitted into it in stripes (chevron?) , would be excellent! I also picked up Knit Today and Simply Knitting. I’m going to have a read of them and see if they are Yay or Nay. 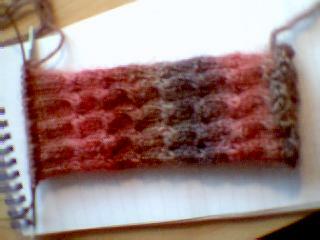 Here is a quick peek at my mum’s Clapotis. I have just passed the halfway point. I feel super-inspired now! The good thing about knitting an aran jumper is that I’ll probably do it on 5.5mm, if not 6.5mm needles, so hopefully it will be a quick, well-fitting knit! Yay! It may be bad, but at least it’s something to look at. I’ve been feeling bad about not posting pictures. 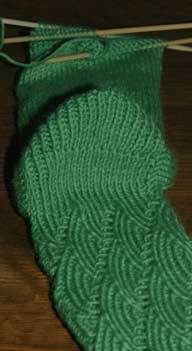 Here’s my green Pomatomus sock. It was much longer than this earlier today but I made a right hames of the pattern and had to rip back. 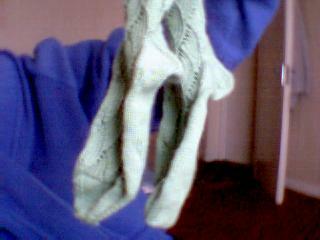 I’m not knitting another pair of these for a while. I’m not sure what kind of socks I’ll make myself next. I’m really tempted to try these in hot red and hot yellow. It’s getting dark at 4pm these days; I need a little hot yellow. You know what else is moving my boat gently up and down? (I was going to say ‘shaking my tree’ but it’s a bit violent… I’m preparing for an early night) This great cardigan that I’d totally forgotten about. I think colour choice is the make-or-break decision of this pattern. I was going to do it in black and yellow, until Alb pointed out that I would look like a bee. I’m loathe to do the green and red because they’re Mayo colours, and I’m from Sligo (black and white… too Diceman… remember him?). Speaking of black and whites, I’m not really feeling the piano love. I’m learning a new contemporary Irish piece that makes me want to pour hot wax into my ears. The one good thing about it is that it is concisely written and is, motivically anyway, easy to understand. I have just spent the last month learning a sonata that is very wishy washy and insipid. I’m really not wishy washy. There’s no beef to this sonata. Where’s my beef?! I could go on. The one piece I do love is Spanish. I totally get this piece… but it’s written in such a complicated manner that it’s like trying to read hieroglyphics. Imagine the scene: sitting in an olive garden at the end of June in the middle of the night. Gorgeous. Now imagine me: sitting in a stuffy pyramid staring at the wall with a cup of tea, stumped, because I can’t get from the pyramid to the olive garden (the very nature of being stumped demands a cup of tea). The Knitting Almanac is providing more than adequate solace. More progress, if any, on the olive garden (and sock) tomorrow.